Earlier this month i introduced you with Orange San Francisco handset along with the tag budget friendly. Now this phone has something special which any other Android phone hasn’t. Fashion TV helps ZTE to make their phone fashionable with their gorgeous color. This Fashion TV Phone features exactly the same specs as the original, but runs on Android 2.2 Froyo and comes preloaded with some exclusive FTV content - apps, wallpapers, widgets, etc. It is available in three colors - black, gold and white - all three of them stamped with the Fashion TV logo everywhere. The ZTE FTV phone packs a 3.5-inch WVGA AMOLED screen and is based on the Qualcomm MSM7227 chipset with a 600MHz processor, Adreno 200 graphics and 512MB RAM. The phone has Wi-Fi, 3G with HSPA, GPS and FM radio as well. 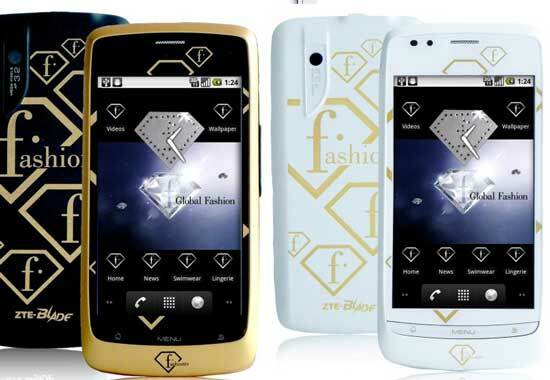 We don’t have the price tag of Fashion TV phone yet, but i hope it is not too high for most of the people.